It's no secret that fall is my favorite time of year. And, except for the 4th of July, to me it's the most historical. 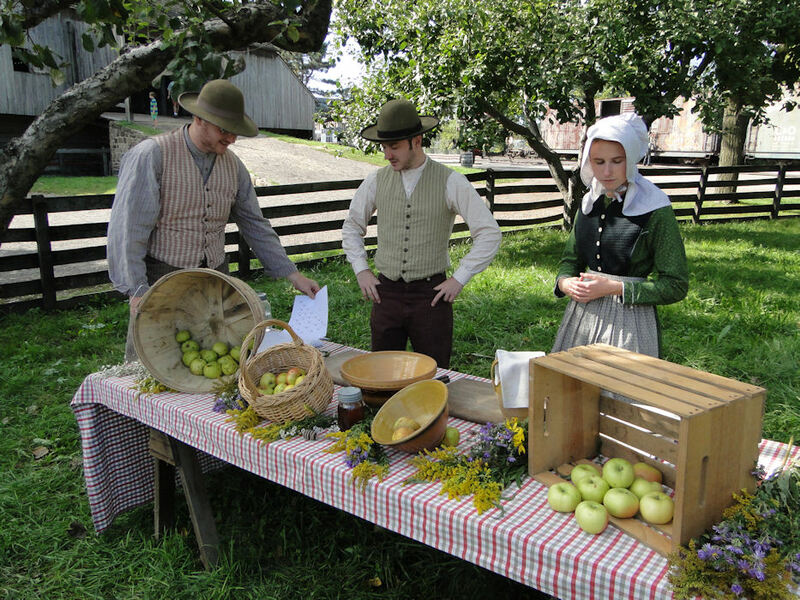 Think about it - - - this is when all of the modern folk go to the cider mill every September and October, following in the steps of our ancestors, who also visited mills or may have had mills of their own and pressed apples into cider at their homestead. So to visit the mills the way 21st century people do today is carrying on an age-old tradition. Okay, I'll grant you the way most of the cider mills are set up today would not be familiar at all to those from long past times: mechanical singing hillbilly bears, mechanical skeletons sitting on the toilet in an out house telling awful jokes, bounce houses, haunted houses, and train rides, among other kid-friendly things, were obviously not around in the old days. 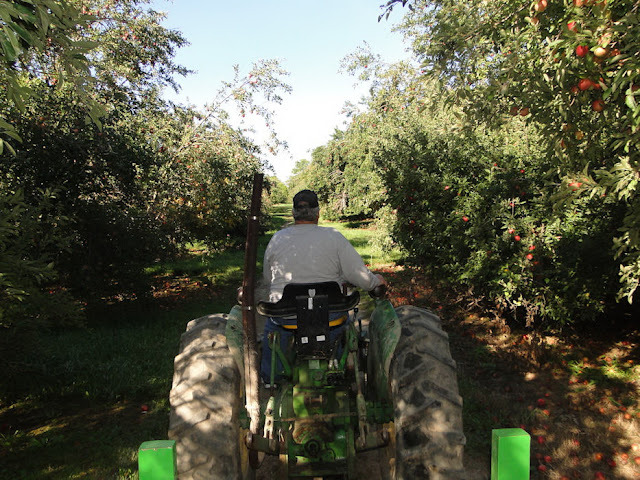 Nonetheless, it's the apples, cider, and doughnuts that are the biggest draw, and literally thousands of visitors travel to countless cider mills that dot the Michigan countryside every weekend from early September through early November. In fact, I believe Michigan is one of the top states in the country for cider mills. 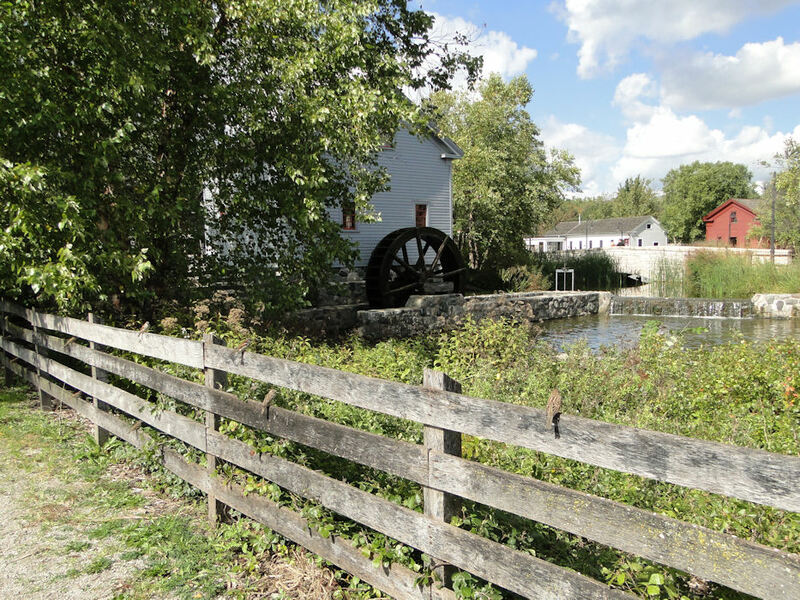 Yet, as my description of many modern cider mills shows, most of the history is gone from the majority of these mills. 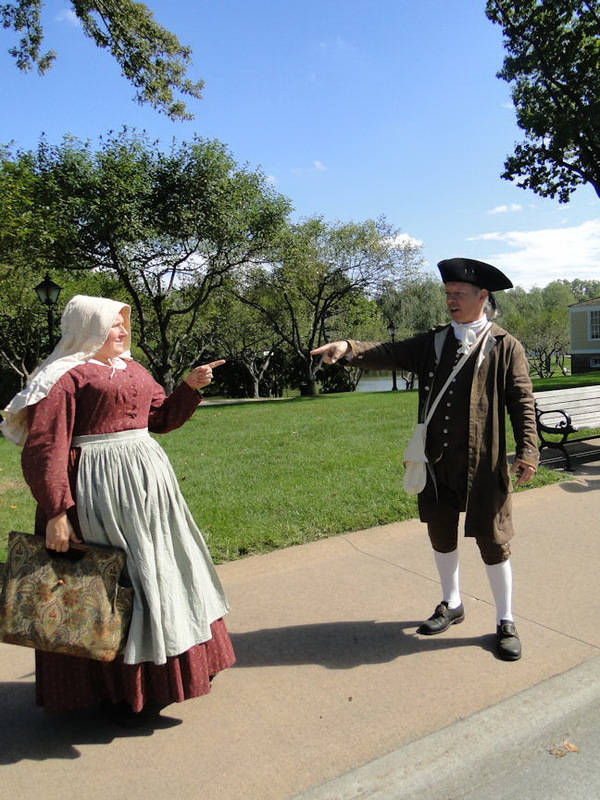 But that's where Greenfield Village steps in and celebrates this historically wonderful time of year in a historically accurate way! 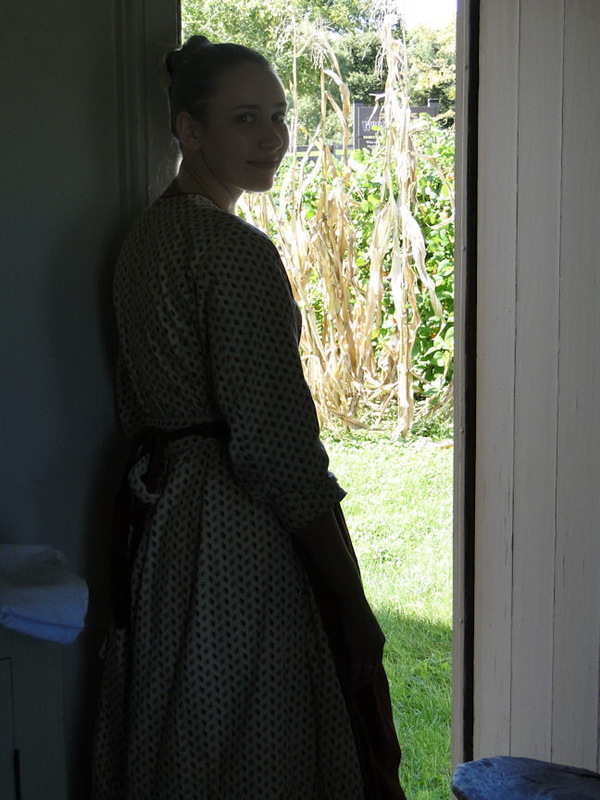 Naturally, I visited while in period clothing so I could kind of place myself in some of the scenarios going on. 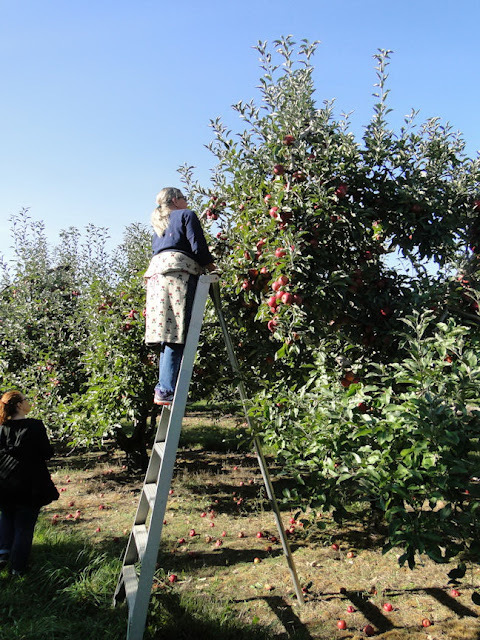 So...for the first part of this week's post, I thought I'd show you a few of my "then" pictures followed by a few of the "now" shots taken of our recent orchard visit. Of course it is difficult for me to go to such a historic place as Greenfield Village while wearing modern clothing. 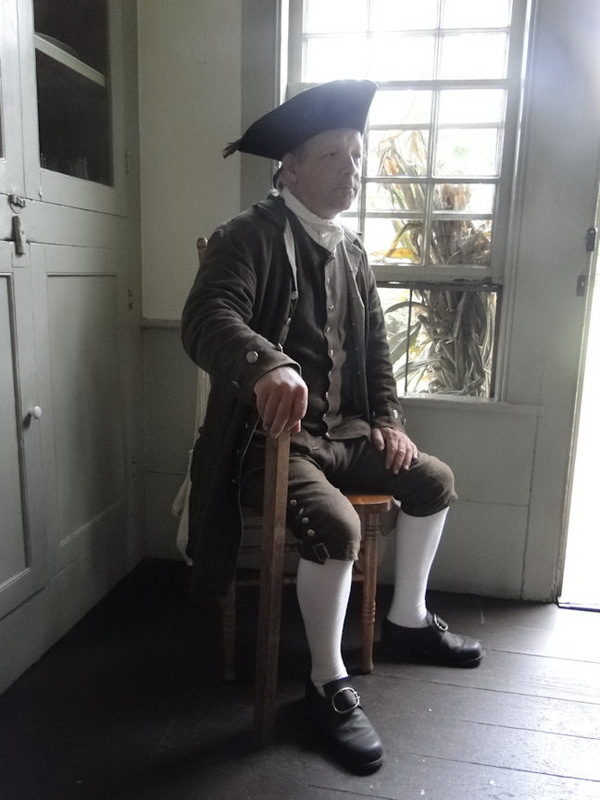 Oh, I do visit in my t-shirt & jeans, mind you, but just as often you will find me in the more 'appropriate' clothing of the era of the colonials (or sometimes Civil War). 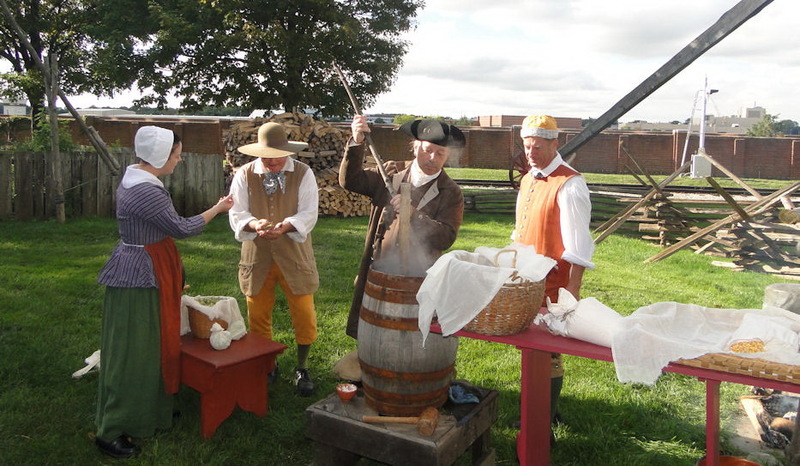 Yep - that's me, 2nd from right, stirring the hops. Roy, the gentleman to my right (in the large brimmed hat) is not only a master presenter at Greenfield Village, but a master brewer as well, and he does things the colonial way. The picture here is one of my favorites: easily in my top 10! 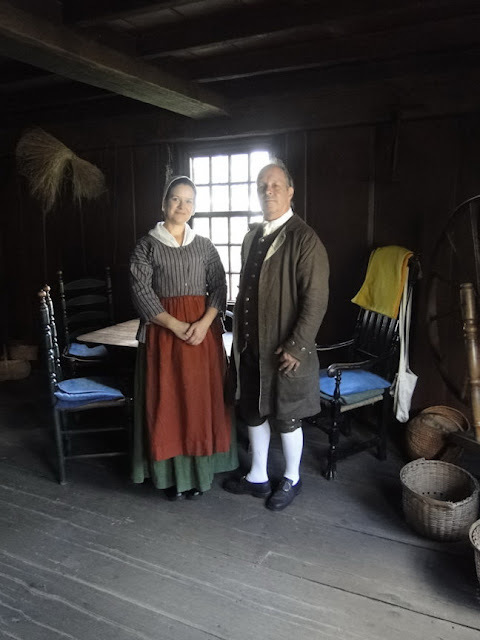 It's a photo taken by my friend April of Village presenter Gigi and I sitting at the table inside the 1760 Daggett House. I've had many nice compliments on this image - a few even saying it looks like a painting. Yes, I am very pleased. Here's a more 'formal' picture of Gigi & I.
I love natural light imaging above all others. I am actually in a home built in the early 19th century here and presented as a home of 1915, but, one cannot tell by the surroundings, so the picture works rather well as a colonial piece, don't you think? 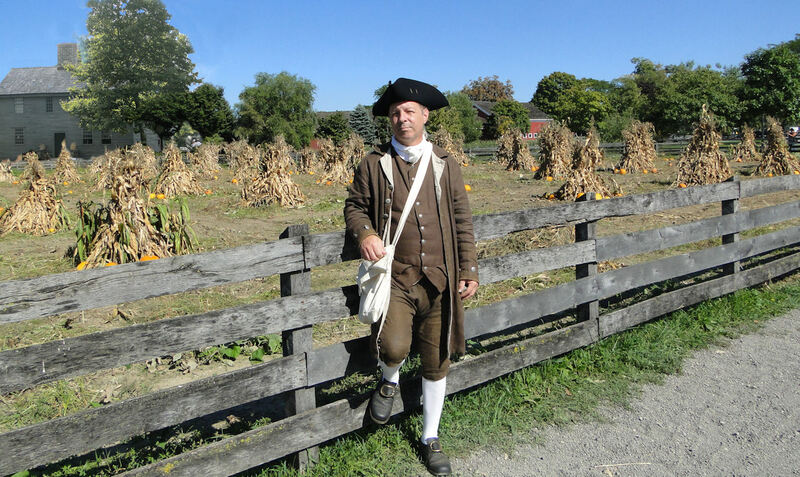 I'm not quite sure why there was a small group of 1812 reenactors - soldier & civilian - set up in the middle of a harvest, but, no matter - - - I love seeing history in its many forms. Clothing? Ahhh...what a difference 35 years makes, eh? 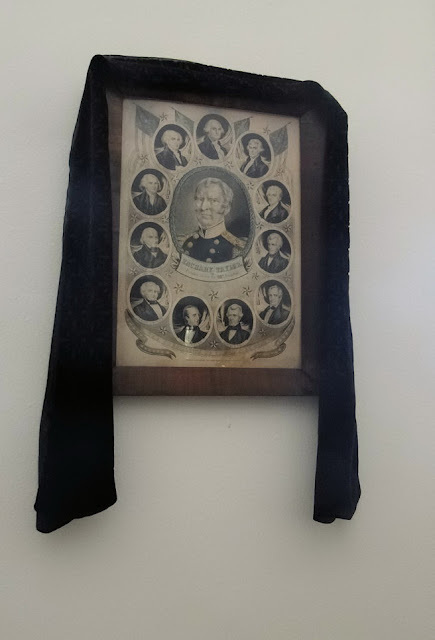 Actually, Paul Revere (who I present myself as) wore his cocked hat & breeches until he died in 1818, so I suppose I am correct here in my fashion with these folks from the future. 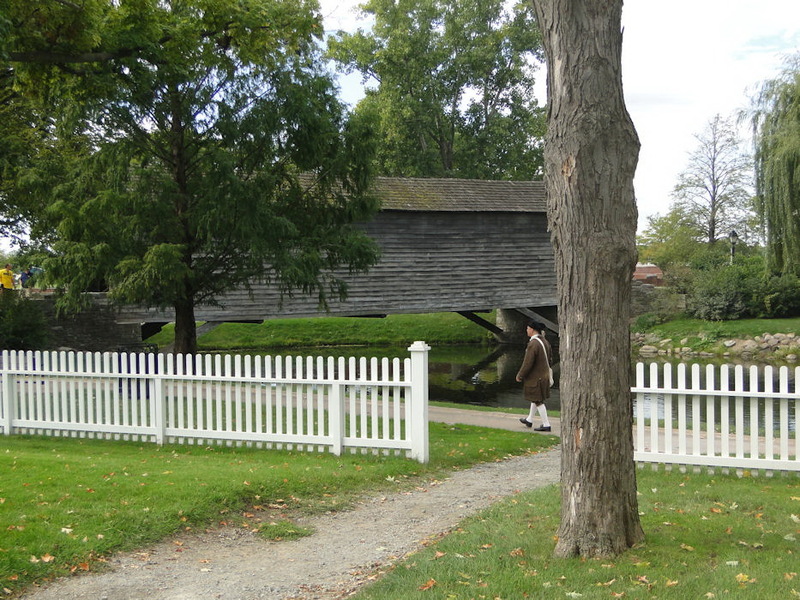 What I would like to see Greenfield Village do is bring back their War of 1812 reenactment that they had a few years ago for the Bicentennial (200th) anniversary of that conflict. 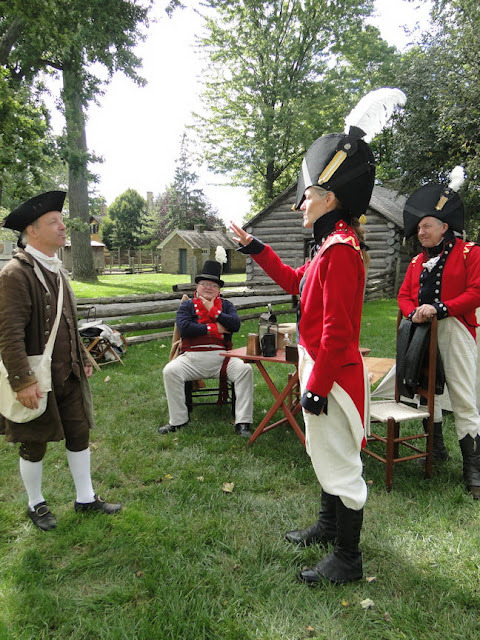 Oh, and they could also bring back the Revolutionary War/Colonial Days event as well, since we are at the beginnings of the sestercentennial (250th). 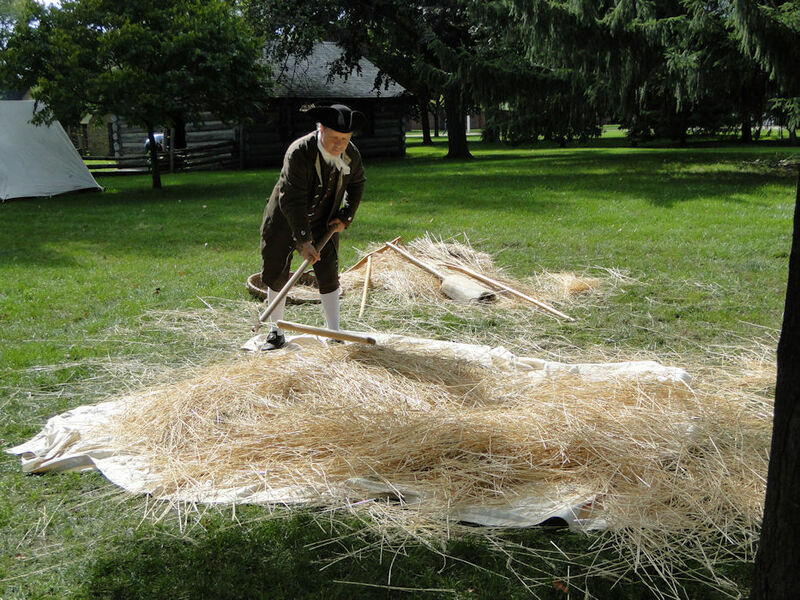 One of the 1812 reenactors brought a flail with them to show how wheat was threshed in the days before the threshing machine. Naturally, I asked if he minded me trying my hand at threshing. 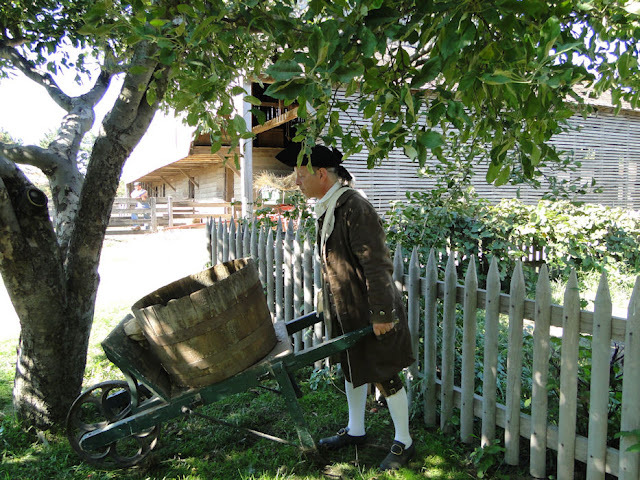 Flails would be used to separate the kernels from the plant (or wheat from the chaff). To flail, one stick is held and swung, causing the other to strike a pile of grain, loosening the husks. With a flail, one man could thresh 7 bushels of wheat in a day. Taking the grain to the mill to be ground into flour. 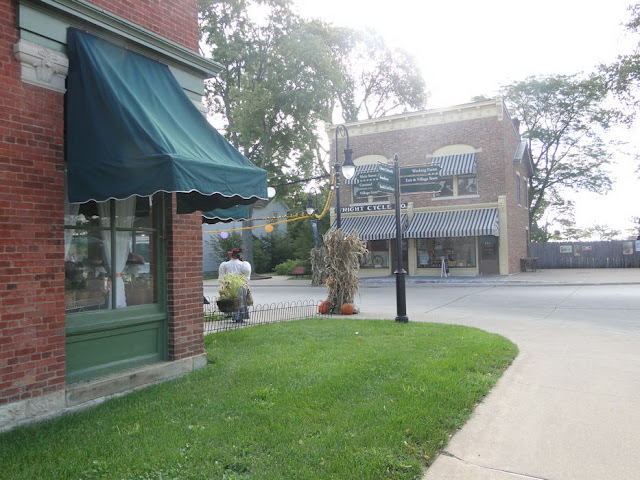 The scene you see here pre-dates the era of the silo, when corn stalks were chopped up and made into a slightly fermented feed known as silage. So instead, corn stalks were chopped and fed as fodder. 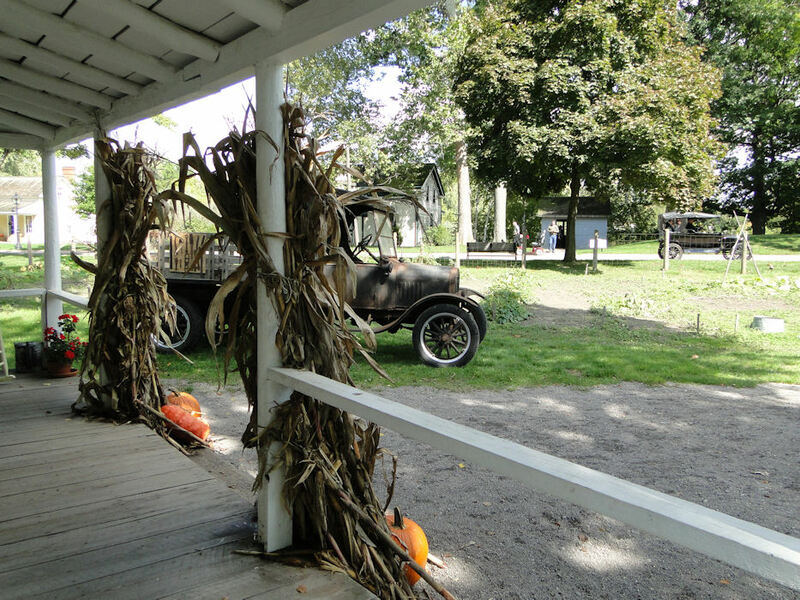 Inside the corn shocks, sheltered from the elements, they retained their nutritional value for quite some time, and the actual shock made a handy manageable portion for the farmer to haul from the field for his cattle. The corn was either picked before shocking, or at the time the shock was pulled from the field. 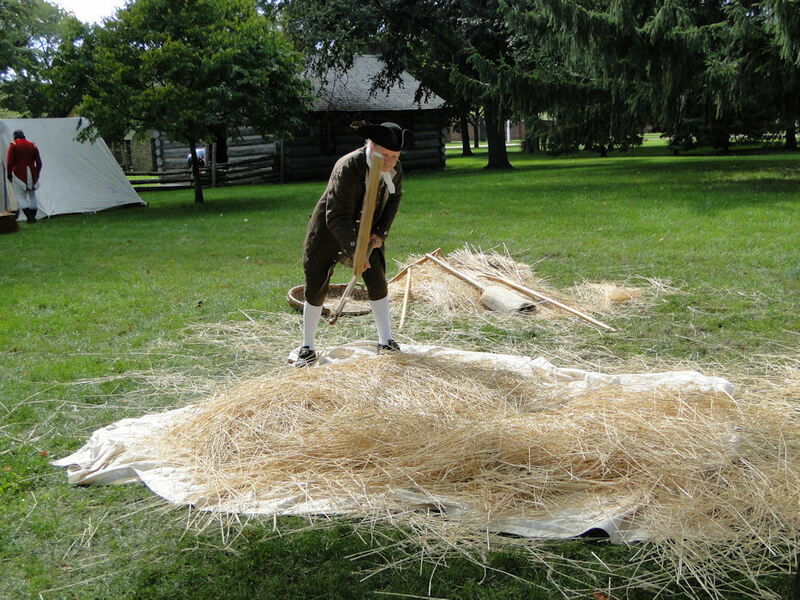 Corn then had to be husked, and then thrown into the corn crib for further drying. Okay, so I may not exactly be dressed for 18th century farming chores - my clothing is more suitable for a "well-dressed gentleman" - but one must take whatever opportunity one can get for photo opps. And lest anyone think I just up and grabbed this wheel barrow...yes, I asked first. 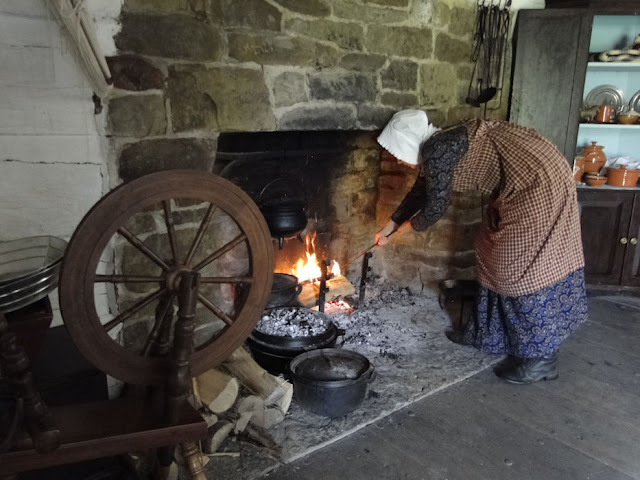 It's a rare occasion to have a McGuffey Cabin presenter cooking over the hearth and speaking to visitors. 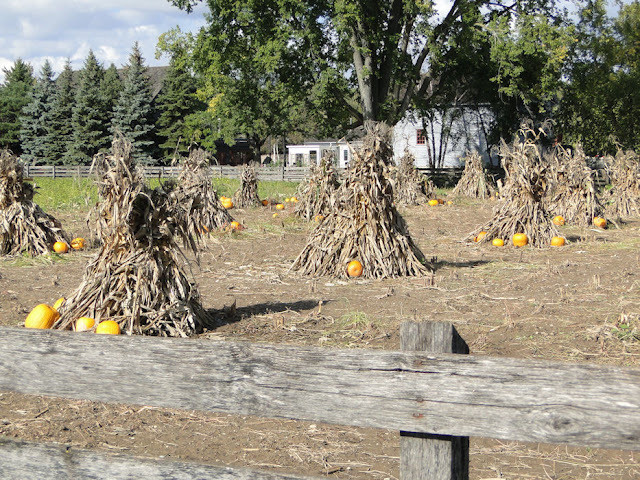 Fortunately for us, this takes place during the fall harvest weekends. 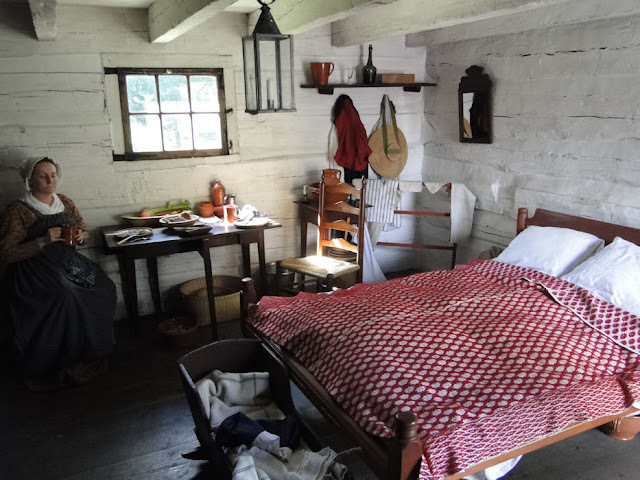 The cabin, though open to the public throughout the year (except for winter), really comes to life when historical presenters are there to tell a bit about life in a frontier cabin, as well as a bit about the birthplace of William H. McGuffey, the creator of the McGuffey Readers school books. "Hey! Aren't you supposed to be a farmer?" "Hey! Aren't you Sybil Ludington, the female Paul Revere?" Oh my...the time-space continuum is all awry! 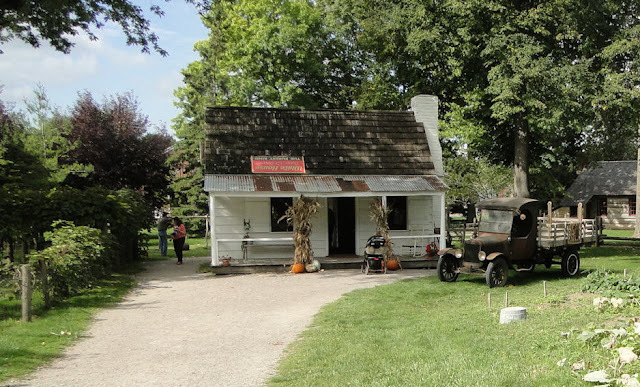 The Eagle Tavern represents a diner from 1850, with the servers, greeters, and hosts all dressed appropriately. The food served is period correct as well. But here is something I'm not sure if they've ever done before - or maybe I just never noticed - but they had the wall hanging of President Zachary Taylor draped in black mourning crepe, for in history the 12th President had died earlier that summer (July 9, 1850). This is a great little touch, don't you think? Greenfield Village presenter (and 21st Michigan Civil War reenactor) Jillian very willingly posed for me here inside the Ford Home Kitchen to allow the fall splendor to shine through the back ground. 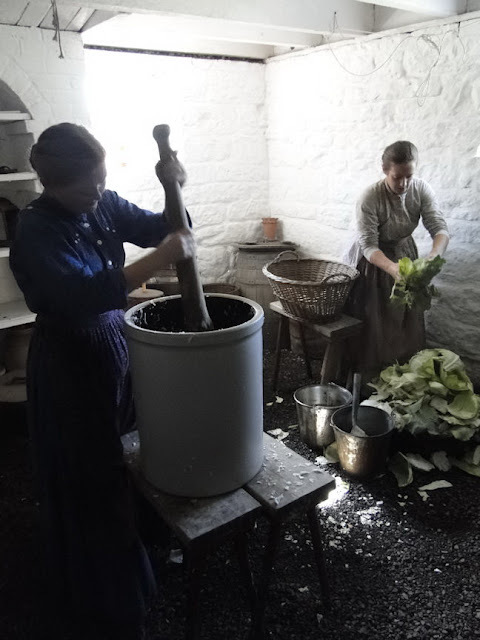 Meanwhile, in the cellar of the 1880s Firestone Farm, the ladies are making up a batch of sauerkraut. 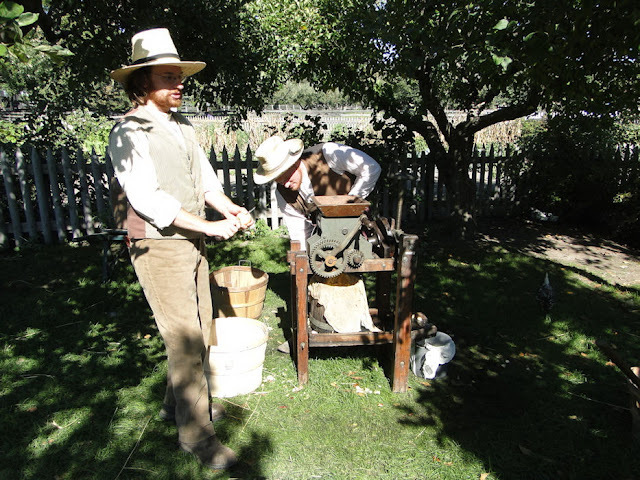 Outside the house, the men were pressing apples into cider. 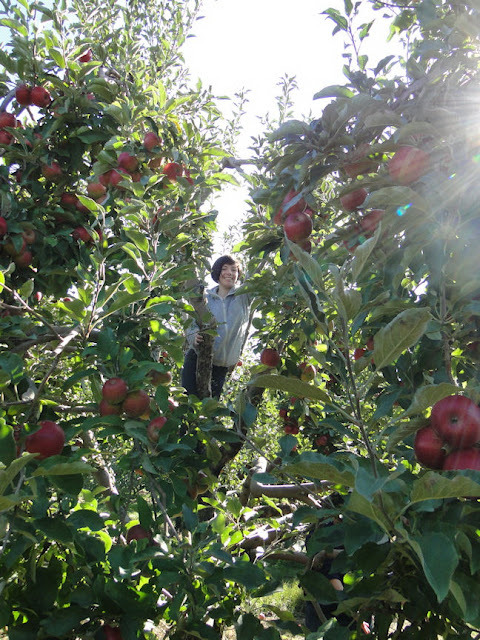 Firestone Farm has an heirloom apple orchard with such varieties as Rambo, Golden Grimes, Maiden's Blush, Roxbury Russett, and others, so their cider, pies, and apple cakes have more of a period taste to them. In fact, during the harvest weekends, Firestone Farm presenters give a tour of their heirloom apple orchards to visitors, telling the history of the apples mentioned in the previous picture. 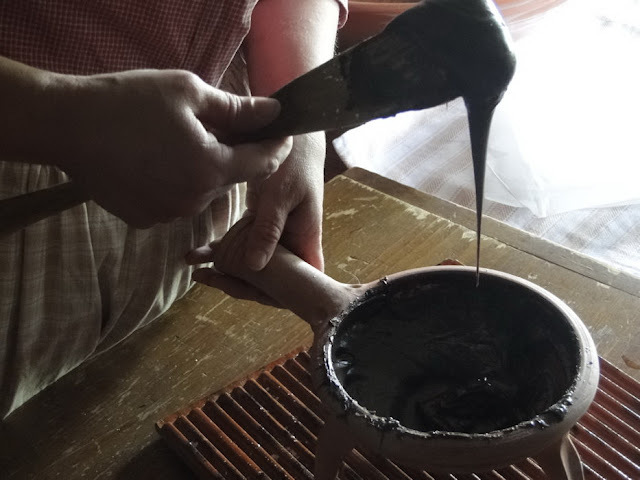 And best of all - - - visitors actually get to taste the past! 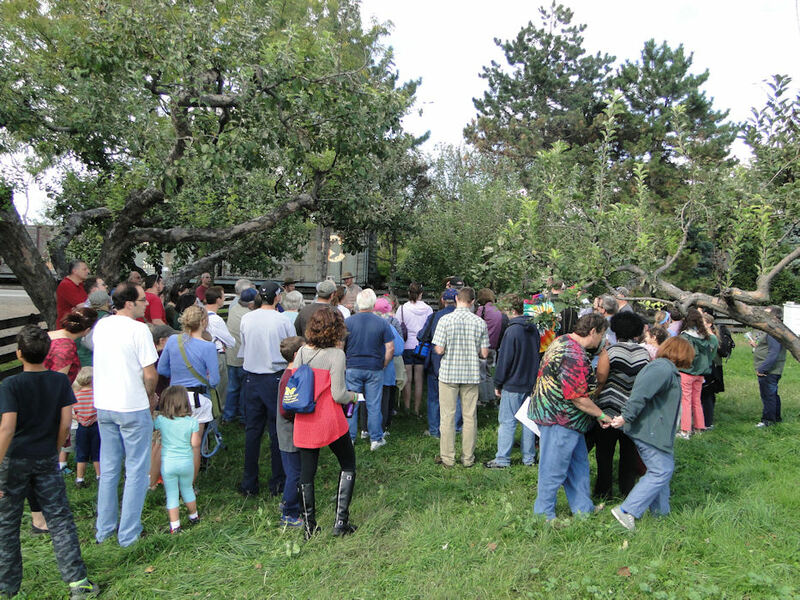 Yes, at the end of the tour, we are able to have a taste of the different varieties of heirloom apples - apples not found at your local grocer, or even, in most cases, at your local orchard. Here is a picture I took of my friend April. 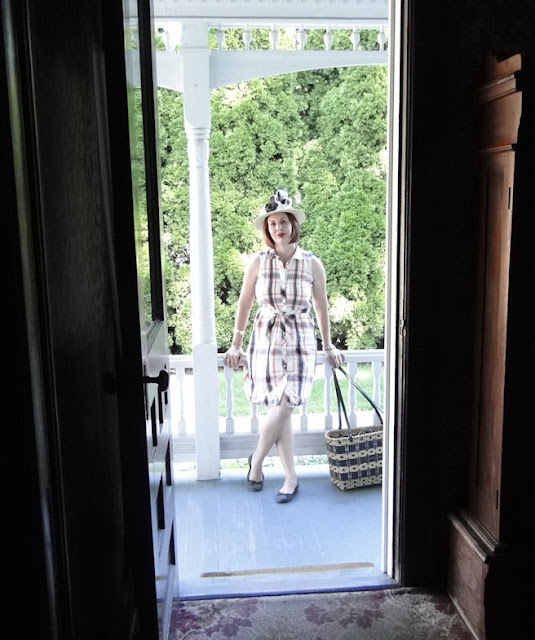 I was inside the home of Wilbur and Orville Wright while April was just setting outside leaning against the porch rail and waiting patiently. I saw the perfect picture opportunity - - and I am happy with the results! 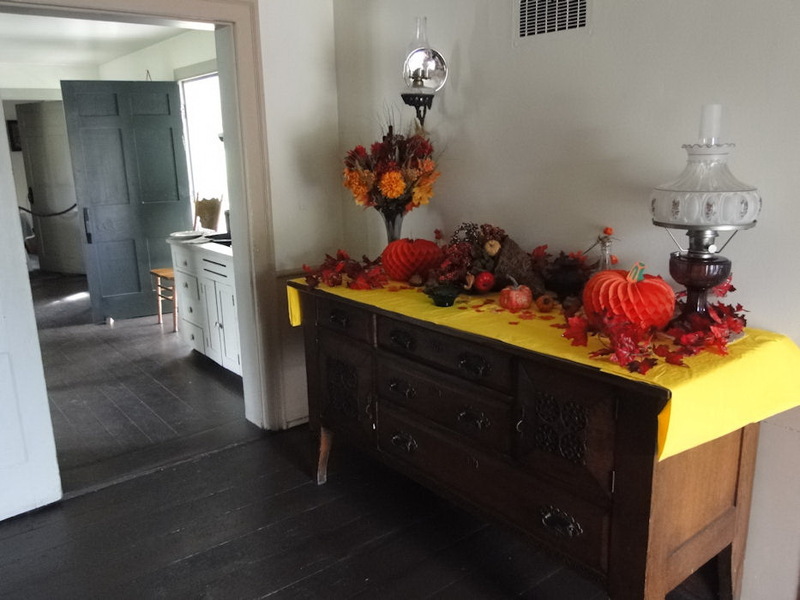 Inside the Edison House it is 1915, and by this time in our nation's history, Hallowe'en was becoming more of the holiday that we know it to be. The Mattox House is one of the tributes Henry Ford had made to African American history, showing southern life of black families in the south in the 1930s. 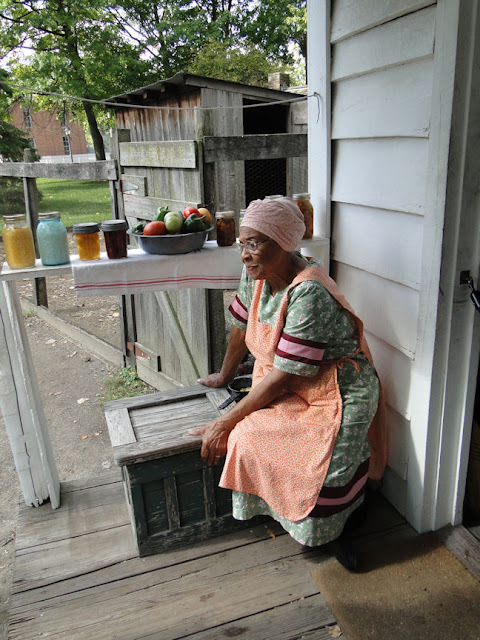 This wonderful woman is affectionately known by her co-workers and regular visitors as 'Mama Jean.' 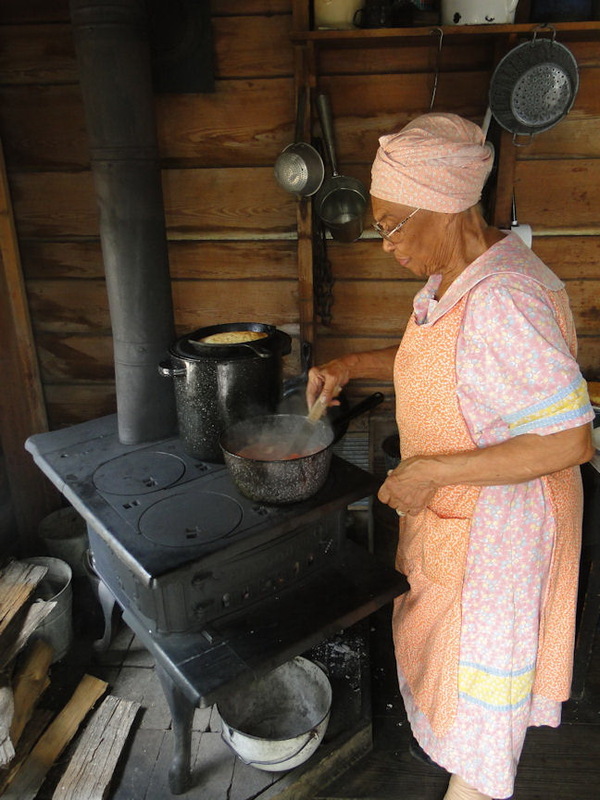 Not only is she is a wealth of historical information (she lived through the period she is representing), but knows her way 'round the southern food stuffs! Oh yeah, the smells emanating from the kitchen here are enough to make your mouth water. This is just me trying to be "artsy" in front of the Mattox House. 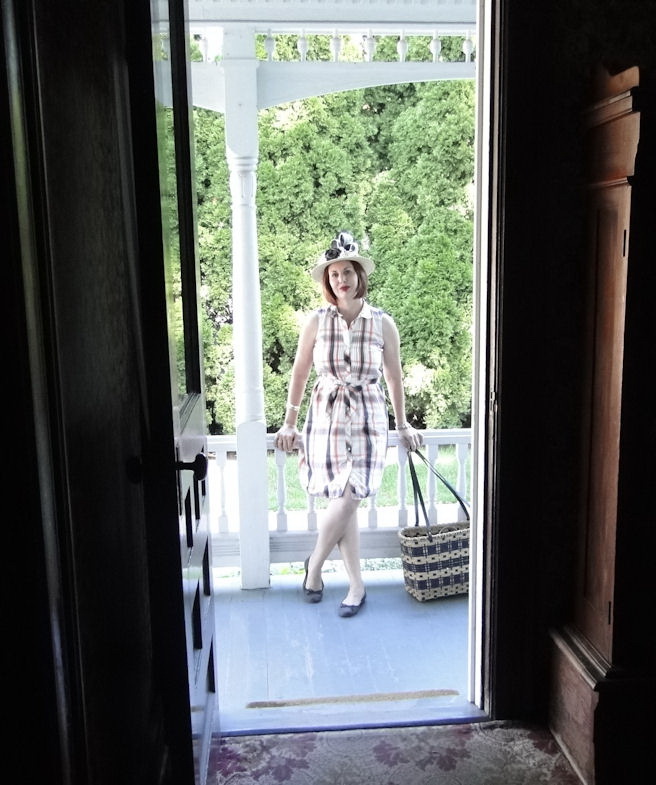 Though I was dressed in my 1770s clothing, April had worn a style that, even though it was more 1960s, it reminded me of the 1920s or 1930s. She fit right into the scene here. I love celebrating autumn past. Yes, we ---ZAP! !--- suddenly find ourselves back to the future...to 2016. 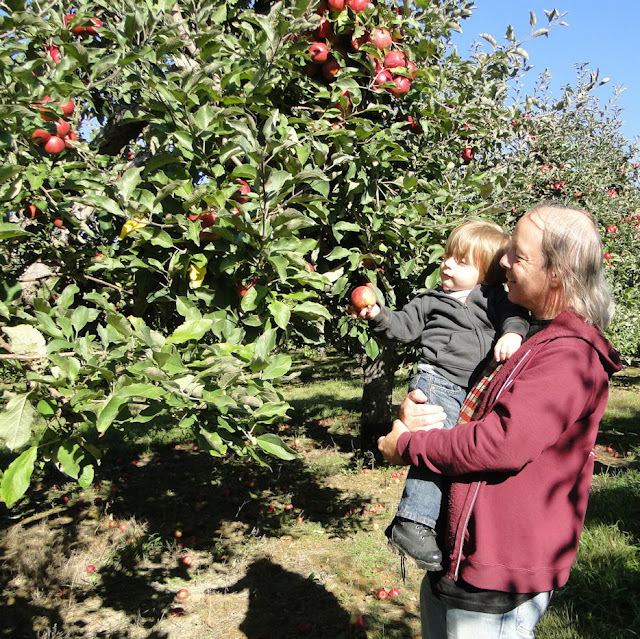 And just like I mentioned at the top of this posting, my family and I are but a few of the thousands who visit a cider mill and apple orchard during the fall weekends. Only, instead of patronizing those mills that have singing hillbilly bears and skeletons on the toilet telling bad jokes, we go to an orchard & mill where we can pick our own apples, buy cider & doughnuts, and maybe climb a haystack. 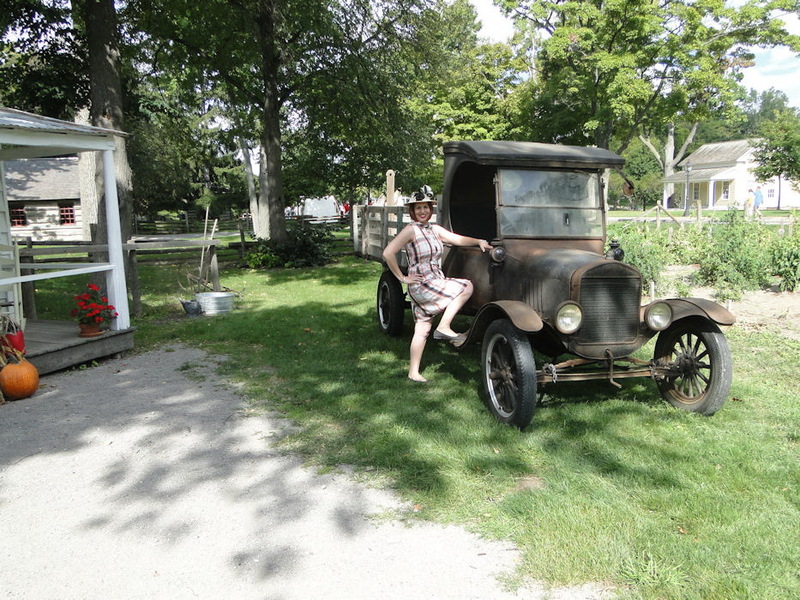 Not quite like the kind our ancestors used to know, but rustic enough to have a sense of history. Here I am in the 21st century. 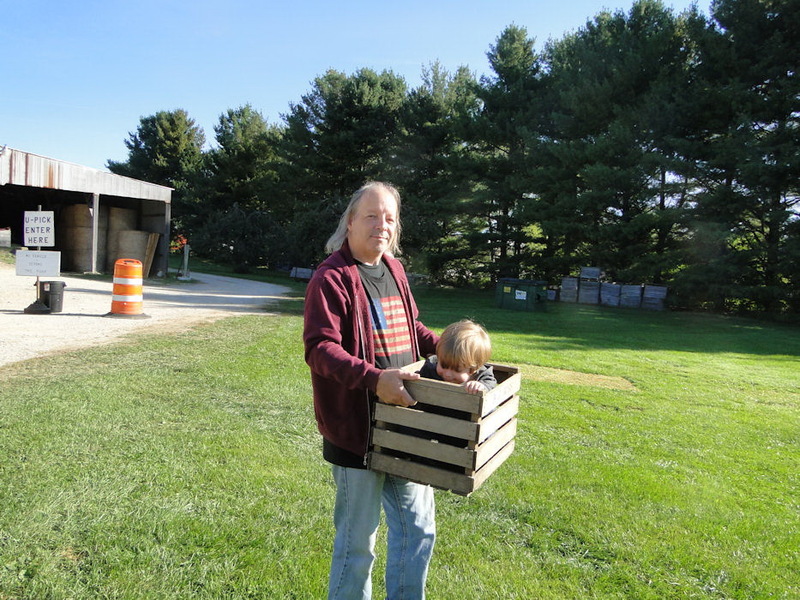 And that's my grandson in the crate! 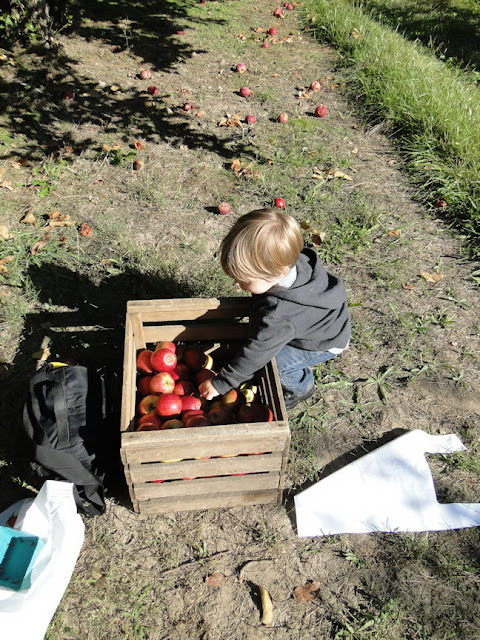 Pickin's are good this year! My grandson, Ben, and I. 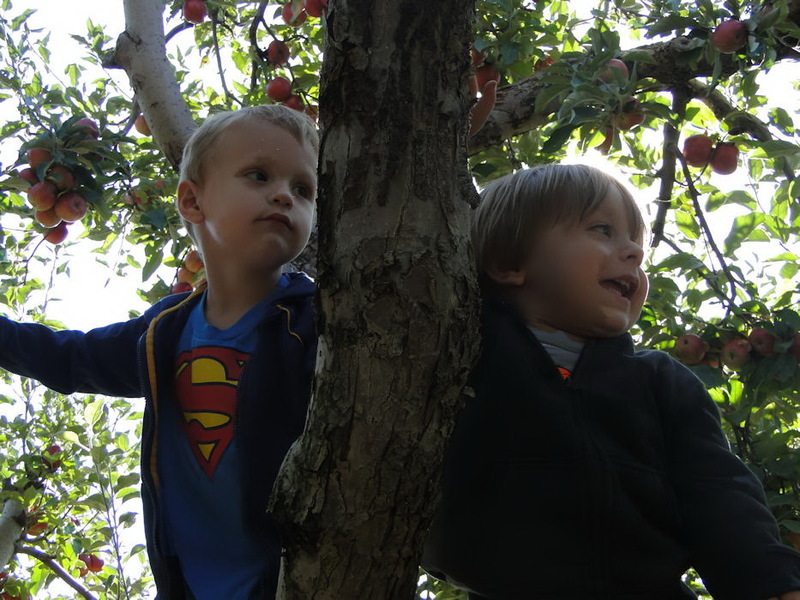 This just might have been Ben's first time ever picking an apple off the tree! In the crate it goes...Nonna's going to make apple pie with them! 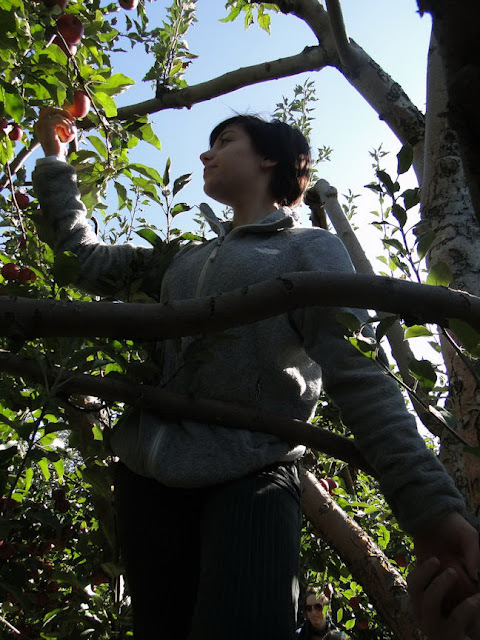 My daughter enjoys climbing the trees to reach the apples. That's Ben on the right and his cousin, Hank (my grandnephew) on the left. Yes, they're in the tree as well. Raspberry bushes! We had to pick (and eat!) a few raspberries as well. 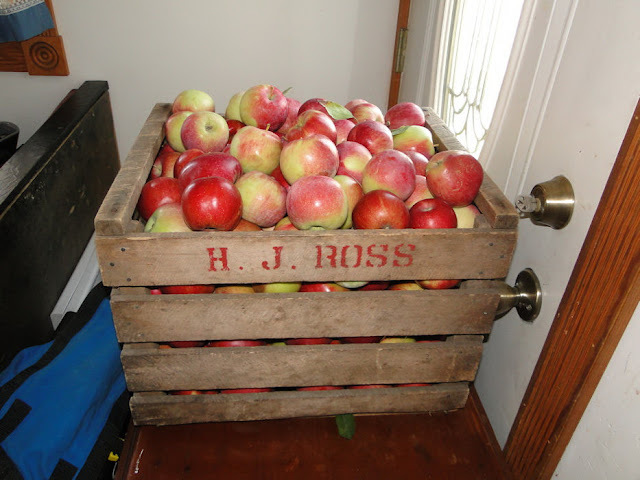 Our crate of apples. They make the kitchen smell great! And soon...a pie to make the entire house smell wonderfull! 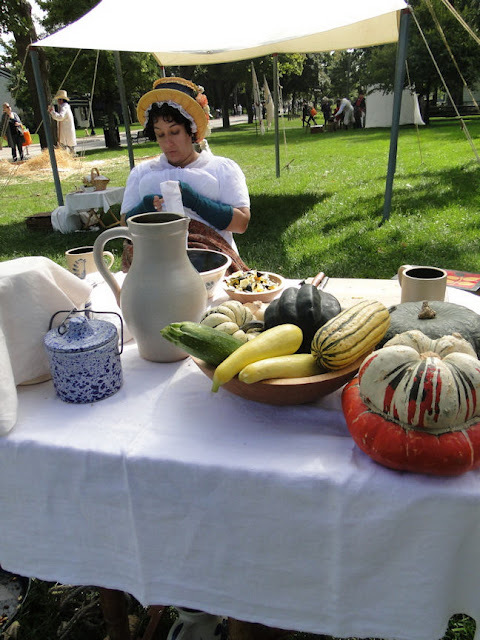 There you have our celebrations of harvest time, past and present. Well...part of our celebrations...the civilians of the Civil War reenacting group I am with - the 21st Michigan - also puts on a fall harvest presentation as well. Check out the links below to see what we've done in previous years. Anyhow, once again, I hope you've enjoyed my little excursion here.